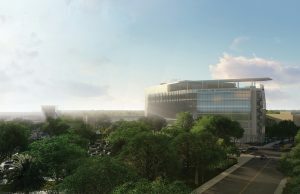 On Wednesday the Boca Raton Regional Hospital (BRRH) officially unveiled a $250 million campaign that will support the most ambitious period of growth and expansion in its history, valued at more than half a billion dollars. The fundraising effort, entitled “Keeping the Promise – The Campaign for Boca Raton Regional Hospital” is highlighted by eight-figure philanthropic gifts from five long-tenured members of the BRRH family which include Christine E. Lynn, Stanley and Marilyn Barry, Richard and Barbara Schmidt, Elaine J. Wold, and Louis B. and Anne W. Green. Keeping the Promise is the largest campaign in the hospital’s 51-year history and has already raised $115 million toward its goals. The multi-level campaign project supports several key features of the hospital. The new 180,000 sq. ft. seven-story patient tower is the centerpiece of the campaign. The tower will feature an expansion of the surgical suites, an inviting patient lobby, and three floors set aside for future growth. The campaign is also expecting the Marcus Neuroscience Institute’s (MNI) surgical growth to expand at an astounding rate over the next five years in all neuroscience programs with an emphasis on neurovascular/stroke, CNS tumor, spine, and epilepsy/seizure disorders. In the current hospital building, all 400 rooms will be converted to private in a comprehensive renovation, and a 20-bed observation unit will be added. A 972-car parking garage will also be constructed. These investments are the initial steps toward an even broader vision for the campus over the next decade with greater access points and even more specialties. The announcement took place at a briefing at the Christine E. Lynn Women’s Health and Wellness Institute on the campus of Boca Raton Regional Hospital. The event was attended by BRRH leadership, and officials, including Scott Singer, Mayor of Boca Raton. During the event, Keeping the Promise lead campaign donors were feted, and the goal of $250 million was unveiled. Jerry Fedele indicated the campaign, and initiatives, will provide essential resources that will drive innovation and excellence throughout BRRH, ultimately improving the region’s health, well-being and quality of life. The Hospital is a designated Comprehensive Stroke Center by the Florida Agency for Health Care Administration (AHCA). BRRH is recognized in U.S. News & World Report’s 2018 – 2019 Best Hospitals listing as a Top Ranked Regional Hospital, for the fourth consecutive year, and the highest ranked hospital in Palm Beach County.